Data journalism is all the rage. Many of the most impressive journalistic projects involve processing or visualizing large amounts of data, like the Panama Papers investigation by the German Sueddeutsche Zeitung or smaller projects like the map of bacteria in New York’s subways by The Wall Street Journal. It’s no surprise, then, that many journalists are wondering if they should learn data skills to be able to work on such projects. But how do you get started? Do you need to go back to school? Do you need to learn coding? And how do you translate the skills you have learned into actual projects? SWINY has assembled an expert panel that will try to answer these questions—and more. We’re now offering a special price reduction for this one-of-a-kind event. If you’ve already paid, look for a refund in your PayPal account. If you paid by check, we’ll give you a cash refund at the event. Refund/cancellation Policy: SWINY will refund admission fees provided we are notified by noon on Monday, August 8, 2016. Olga Pierce, deputy data editor at Pro Publica, is a graduate of the Stabile Investigative Journalism Seminar at Columbia University, where she won a Horton Prize for health reporting. Other awards include the 2011 Livingston Award for National Reporting for her reporting on increasing corporate interference in the drawing of congressional districts. Olga has appeared on CBS News and C-SPAN, and her stories have been featured in The New York Times, USA Today, Chicago Tribune and the Hindustan Times in New Delhi. Martin Burch, data journalist at The Wall Street Journal, focused on health and science writing while attending CUNY Graduate School of Journalism. Since graduating, he has worked on Journal interactive graphics including subway bacteria and Medicare billing. Aleszu Bajak teaches journalism, design, data visualization and programming at Northeastern University and Brandeis University and is the editor of storybench.org, an under-the-hood guide to digital storytelling. He is also a senior writer at Undark, a magazine exploring the intersection of science and society based at the Knight Science Journalism Program at M.I.T., and freelances for outlets like The Washington Post, The Boston Globe Magazine, and the journals Nature and Science. 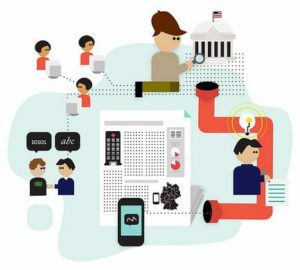 Jue Yang is the technologist-in-residence at CUNY Graduate School of Journalism, advising students on building data-driven projects from scratch. She has also worked as a web designer and front-end developer. Her work covers aspects from user experience to visual identity to front-end architecture. Sample projects include the United Nations Development Programme (UNDP) open data portal, which tracks financial and outcome transparency of UNDP projects, and the Woodstock Institute Map Browser, where users can explore foreclosure and mortgage data (among other data indices) in the state of Illinois.